Khammam city is situated on the banks of river Munneru, which is amongst one of the tributaries of the great river Krishna. It is located in the north central zone of Andhra Pradesh. Khammam has a very diverse culture and accounts for highest tribal population in a city. It perfectly portrays a great example of communal harmony and this act as a unique factor for the city of Khammam. 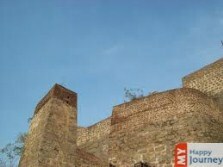 The place also holds a lot of historic significance as well because of the Khammam fort. This fort is situated at the top of a hill and sets out a good example of great form and style of architecture. And this architectural importance if further enhanced by the fact that various kings constructed this fort varyingly at different times. Khammam, from ancient times of Taluks, was a hub of various social and commercial activities. And even today Khammam is a famous coal mining site and houses many workers. It has many irrigation sources as well, one of which is the Nagarjuna Sagar Project which caters to the majority of the need of irrigation. This place holds religious importance as well; the Narsimha Swamy temple is amongst one of the main shrines considered important within the city. All festivals are celebrated in this temple, following both the tribal as well as modern rituals which make these celebrations an elaborated ceremony. The major places that attract tourists and visitors from various places to Khammam are the mosques and their detailed architecture. Also most of the mosques are adjacent to one another.